This is a thank you letter from Miss Berry to Mrs. Schlotman thanking her for her gift. She also asks that she tell her friends about the needs The Schools are facing in hopes that The Schools will get more funding. 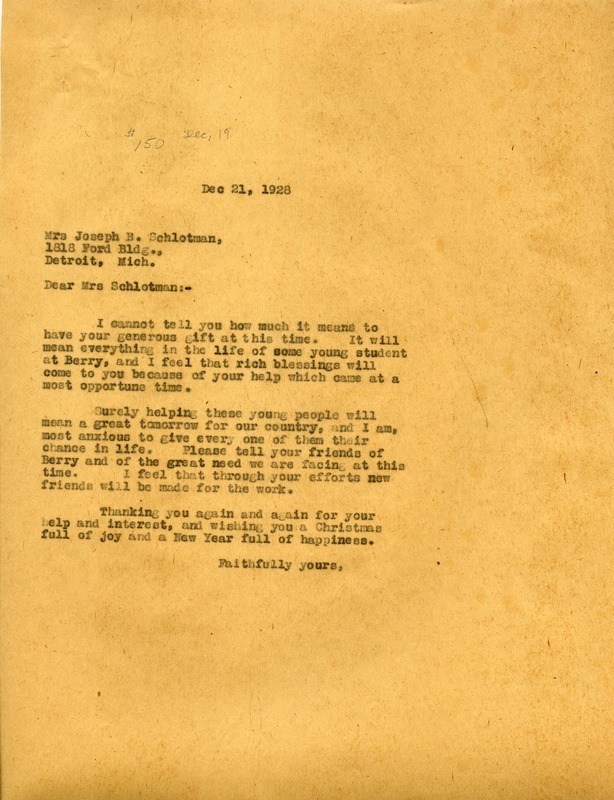 Miss Martha Berry, “Letter to Mrs. Schlotman from Miss Berry.” Martha Berry Digital Archive. Eds. Schlitz, Stephanie A., Rachel Renaud, Hannah Bailey, et al. Mount Berry: Berry College, 2012. accessed April 24, 2019, https://mbda.berry.edu/items/show/8879.